I'm running a survey on students to collect their feedback of the courses of study they've undertaken in a college. They have to answer the same question for every course they study. There are some multiple choice (radio buttons) questions and some qualitative (textarea) questions. We've experienced an unusually high number of people indicating their dissatisfaction in the multiple choice questions and then going on to praise the course in the written answers. We want to find a way of making more explicit the choice the user has made but without it being obtrusive (e.g. 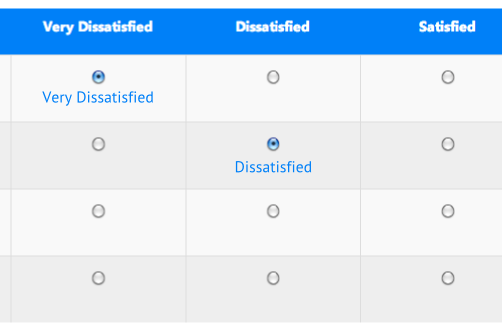 a modal: Are you sure you're dissatisfied??!). What are some ways this could be achieved? You could indicate under the selected response the actual value - as in the image below, so that users get immediate (but non blocking) feedback in-place for the response they just selected. Also you might try not putting the header in inverse colours as that slightly hides the content as the user moves from the question to the response, and as the header shows the response values, it's a key element that should be as clear as possible. 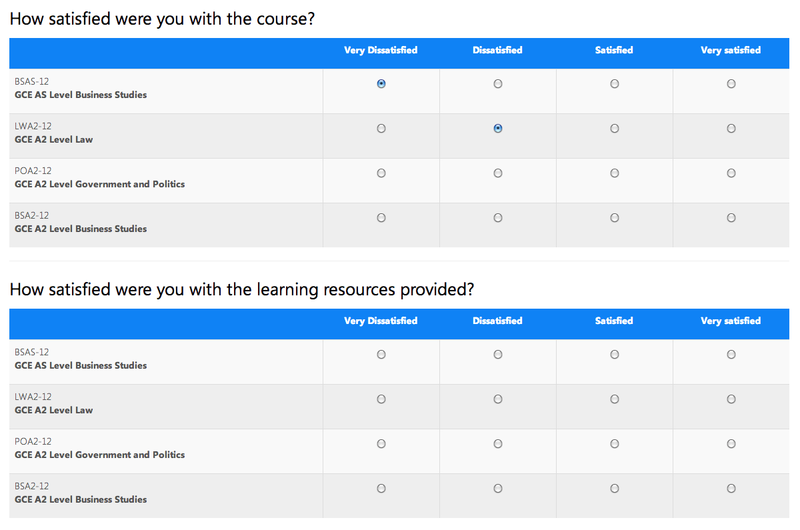 Another option is not to mention the word 'satisfied' in the question as it's slightly leading - but instead to ask something like How did you feel about the following courses as that will force the user to read the response options in the header rather than jumping straight into an assumption that the values range from one end of a scale to the other in a particular order. Number 1 and 4 are "anti-questions". If a survey taker answers in a corresponding way (more or less the same meaning) on those two questions, it is more likely that he or she has read the questions carefully and has thought the answers through; than if the meaning of the answers do not match at all. Also, a "Not sure" or "Don't know" alternative, helps to avoid false data from all those situations where a taker is not able to answer in a both well-reasoned and honest way. As a silly, but easy example, some people that are forced to answer "Would you recommend it to friend?" could perhaps be thinking "Hmm would I? Do I know anyone interested in this fine art? Nope, not among my friends. It's a No". Providing "Don't know" is an easy fall back for handling the risk of dubious questions or survey takers. Maybe the design is not explicit enough before the question is answered and that is why people are confused. There is enough questions in this form, since we all know answering those surveys are a pain, you do not want to had others by asking for confirmation. You can also change the order of the answers since most of people are not even going to read and are going to click in the first radio button. I guess disappointed people in the opposite will want to share their feelings and put some effort into the survey. For another argument, you can read this article about Left-Side Bias. You should definitely alternate closed and open question, so the student will be able to explain his answer in a row and make some relation between the two questions. Your problem as far as I understood is coherence between answers, I guess it has something to do with the coherence of the survey itself. Rather than group by question, you should try grouping by course. Question 1 -> think about course 1 in context of question -> think about course 2 in context of question -> think about course 3 in context of question -> think about course 4 in context of question. Question 2 -> think about course 1 in context of question -> think about course 2 in context of question -> think about course 3 in context of question -> think about course 4 in context of question. Question 3 -> think about course 1 in context of question -> think about course 2 in context of question -> think about course 3 in context of question -> think about course 4 in context of question. Question 4 -> think about course 1 in context of question -> think about course 2 in context of question -> think about course 3 in context of question -> think about course 4 in context of question. What you are essential doing, is reducing the number of contextual jumps the student has to make while answering the questions. Granted it get's repetitive, but, it should be faster to fill up the form. There should be a default selection in radio buttons : now selection of default is a bit tricky, if you select extremes you end up messing the the results, might go with the neutral option as the default selection. Not the answer you're looking for? 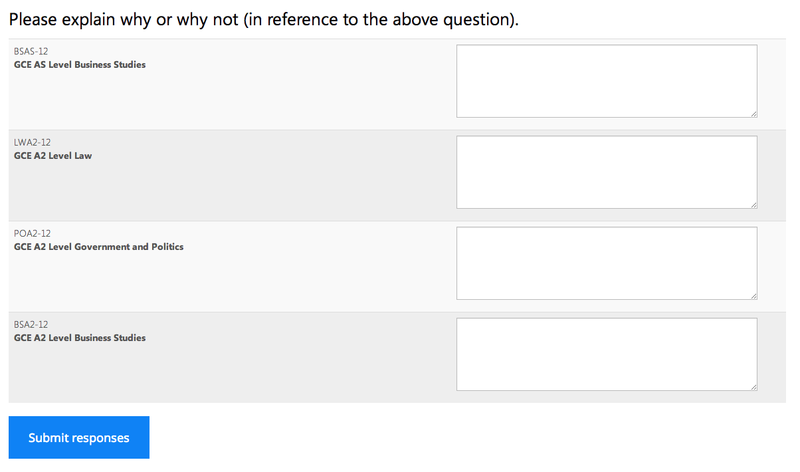 Browse other questions tagged forms user-behavior input surveys or ask your own question. How to evaluate average results on an UX survey? What options to give for multiple choice subjective feedback?